Y’know, sometimes I just have to stop and contemplate how lucky I am, ya’ll. I mean, there are times when it gets to me: the performance anxiety, the fear of failure, the Bookscan/Amazon/etc. numbers, the deadline pressure, the financial struggle. I’m a “big picture” kinda gal, but I’m also human, and in this business it’s easy to get bogged down in the details. But every so often, something happens that smacks me out of my navel-gazing, and makes me notice the forest, not the trees. Seriously, ya’ll, I know this number isn’t anything special compared with the Chicken Soups of the world… but it’s special to me. Because this number reminds me that there are people out there who read my work, and who care enough about it to comment on it, even if they dislike it. And frankly, the vast majority of them — you — like it (over 70% of those ratings are 4 or 5 stars). I cannot begin to tell you how awed and humbled I am by this. 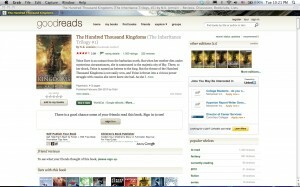 I just read The Hundred Thousand Kingdoms and enjoyed it. Looking forward to reading the trilogy! Bladdow indeed! I’ll take my 1/1000th of the credit. 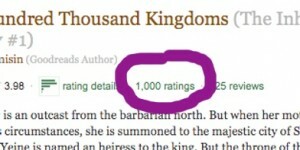 Congratulations on writing something worth that many reviews (and a lot more)! I really couldn’t put it down. I didn’t want to leave the spell of words. I loved how it made me think of gods in new ways, and how you made everything seem so inevitable. And I was absolutely furious (SPOILER ALERT SPOILER ALERT SPOILER ALERT) when Madding was killed – I wanted to shove her call to him down her throat and make her take it back. Just wanted to thank you for writing it. 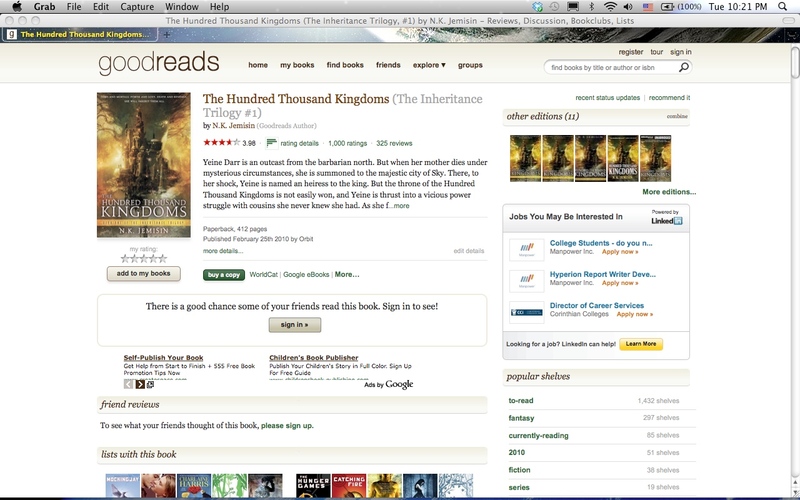 i’d won “The Hundred Thousand Kingdoms” in a giveaway – and loved it so much, i gave away that copy and bought a new one. seriously – i’ve always lived thru books, i spent too much of my childhood in hospitals – i recently became completely disabled, to the point where it’s now HARD to lose myself in a book, because of the pain. then i read your books, and i was returned to heaven. thank you so VERY much, for the beauty [and escapism] that you’ve shared. One thing I haven’t come near is slavishly reading your blog, but I did read enough to catch that you are Terribly (or maybe Wonderfully) Busy, so I won’t officially ask this. But I did find myself wondering as I read the book whether you, like Yeine, are a half-whatever. I wondered because I am. Even if you aren’t half-whatever like Yeine and like me, it was still a pleasant surprise to come across one as a convincing and relatable protagonist. Woo. As a bonus proof of care, I finished THTK in one night, something I think I’ve done with, oh, two? three? books (including yours) in the past five years. So yay. Thanks for writing something that resonated with me. Thoughtful fantasy = soul-balm.